Mark McKee has always had an entrepreneurial spirit. As a teen, hosting high-school parties and concerts became a business. In college, he turned a failing pizza joint below a bar into a regional chain — as well as a clothing business that was nationally distributed with clients such as Bloomingdale's and Macy's. McKee donned the “corporate hat” for a little while at several food-service businesses before turning his sights to his next venture: bringing the London-based Ace Cafe to North America. “I feel like that my experiences have all come together for this business now,” said McKee, 55 of Kansas City, Mo. After several years, the Ace Cafe North America managing partner and CEO will achieve that dream. The motorcycle and car-centric entertainment complex will open its doors May 19 in downtown Orlando. McKee first learned of Ace Cafe through a friend and former business partner. The Ace Cafe in London developed from a roadside cafe in 1938 into a meeting place for motorcyclists and rock ‘n’ roll fans. The eatery closed for about 30 years before being revamped and reopened in 2001. The brand now has locations in China, Finland and Switzerland. Orlando’s venue is the first in North America. The city’s proximity to the Daytona International Speedway and its regular influx of tourists were major reasons to bring Ace to the area, McKee said. Ace executives had an “aha” moment, McKee said, after spotting three 100-year-old structures once home to Harry P. Leu’s supply company. The three-acre parcel of land sits in downtown Orlando at the corner of West Livingston Street and Garland Avenue. It has been a challenge to bring the structures to code and furnish them while also preserving their history, McKee said. Describing what exactly Ace Cafe is has been another challenge. In its two-story main building, Ace Cafe’s offerings include a full-service restaurant, two kitchens, four bars, a coffee bar, a communal counter and private dining rooms. 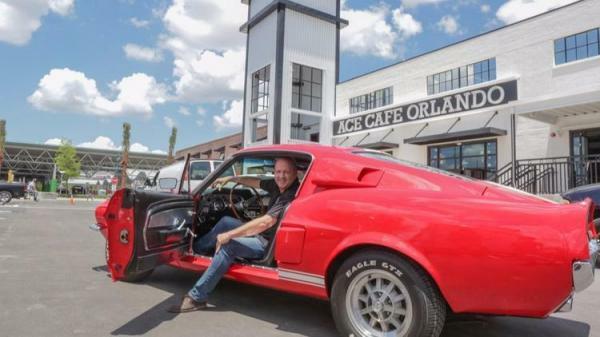 Ace expects to draw about 400,000 people a year to downtown Orlando by hosting events for all kinds of motor enthusiasts.